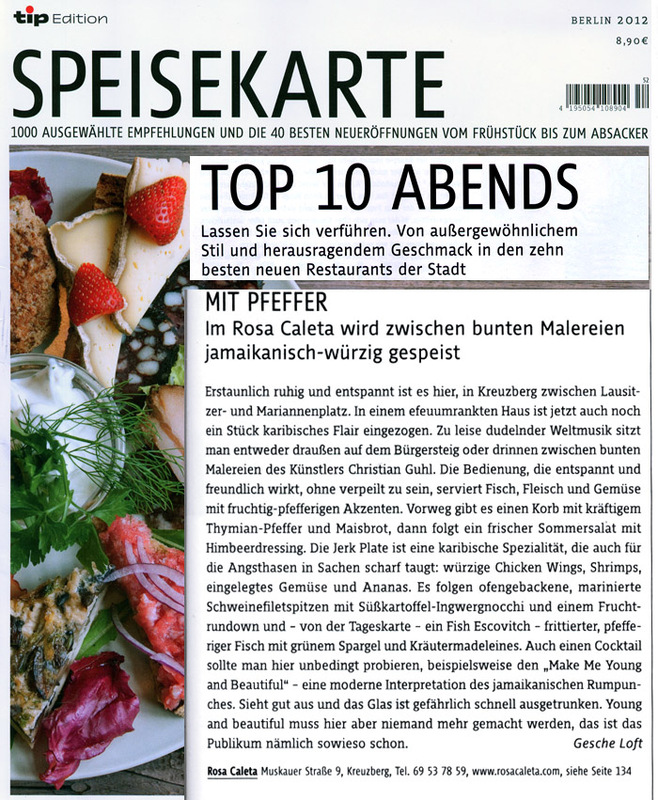 Free translation of the article published in the German restaurant guide “tip Speisekarte 2012” about restaurants in Berlin, Germany. RosaCaleta is in the Top 10 restaurant recommendations for dinner! Caribbean flair has found its way to Kreuzberg (a district of Berlin). RosaCaleta, which is located between Lausitzerplatz and Mariannenplatz, serves traditional Jamaican food. Delicious fish, meat and vegetarian dishes with fruity and spicy flavours are served outside on the terrace or inside between colourful artwork by various artists – currently paintings by Christian Guhl. Meals start with a serving of corn as well as pepper & thyme bread followed by a fresh summer salad with raspberry dressing. The “Jerk Plate” – a Caribbean speciality – including chicken wings, shrimp, pickled vegetables and pineapple also works for those who don’t like it too spicy. Main courses include diced pork filet mignon with sweet potato & ginger gnocchi and the “Fish Escovitch” – fried fish with pepper, green asparagus and herb madelaines. The cocktails are also worth trying! “Make Me Young and Beautiful” – a modern interpretation of the Jamaican rum punch is dangerously delicious. But nobody has to be made young and beautiful here – the crowd at RosaCaleta is that already. 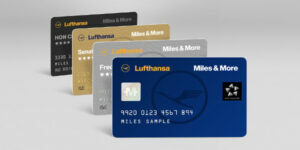 Vorheriger BeitragGet rewarded with the Evercards appNächster BeitragIt’s our 3rd birthday on Feb 18!